Genetic analysis has determined a fungus that has been causing cypress canker disease and killing trees in six out of the world's seven continents originated from California. The fungus, Seiridium cardinale, enters a tree through cracks or wounds in the bark. Once inside, it releases toxins that interfere with the flow of water, sap and nutrients, making the tree sick and eventually killing it. Lead researcher Gianni Della Rocca of the National Research Council in Florence, Italy, noted that "Italian cypress trees are important to the ecosystem, but they are also considered the quintessential trees of the Mediterranean, the ones that dot the Tuscan countryside and that form the landscape of much of Greece, the South of France and Spain." He added "It is difficult to put a price tag on the impact this pathogen has had. It's hard to imagine the Tuscan or Provence landscape without cypresses." Matteo Garbelotto, adjunct associate professor and cooperative extension specialist in ecosystem sciences at the University of California, Berkeley, said "The fungus was likely introduced from California either in the South of France or in Central Italy 60 to 80 years ago, and that introduction resulted in a global pandemic that has devastated the region's iconic Italian cypress trees." Identified in 1928 as the cause of cypress canker disease in California trees, Seiridium cardinale has since spread to Europe, Asia, New Zealand, Australia, South America and Africa, decimating up to 95 percent of cypress, junipers, cedars and other trees in the cypress family. The researchers isolated and performed a genetic analysis of 96 variants of the fungus from California, Chile, New Zealand and seven countries in the Mediterranean. Seiridium cardinale reproduces both asexually - creating genetically identical clones of itself - and, when a different variant is available for mating, sexually. This allowed scientists to analyze the genes of the 96 variants and determine that a variant endemic to California had caused the cypress canker epidemic in the Mediterranean. Also, another variant from California has been linked to the cypress canker epidemic in New Zealand and Chile. In the 1920s and 1930s, California Monterey cypress trees became a hot 'to have' item in Europe, with plant nurseries in France and Italy selling both mature trees and seeds. 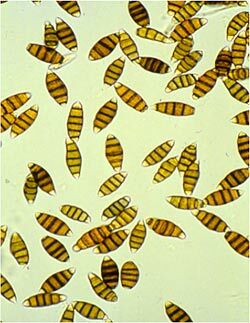 It seems that this trade was responsible for the spread of the fungus, simply because wind and sea currents are not enough to spread identical genotypes so widely. "It could have easily taken 10 to 20 years from the time of introduction for the first major outbreak to occur," said Garbelotto. "In Italy, the pathogen was first identified in 1951, so it could have arrived decades earlier." Garbelotto noted that tests can be designed "to screen for the presence of Seiridium cardinale on plants that are traded, and even to test for the presence of strains that are currently not present in Europe or in the Southern Hemisphere." He added that "technological advancements of the last few years allow for the easy development of such tests, but it was essential to figure out the source of the pathogen in order to know what to look for." At the same time he said that "It is imperative to stop the movement of infected plants in order to avoid further introductions that could completely overcome those lines of resistant trees." Garbelotto recommends that when planting trees, locally cultivated plants should be grown in their native range. Leyland cypress, a popular hybrid that is susceptible to Seiridium cardinale, should be avoided. He also warned that if you have a cypress tree and it develops the disease, you should not plant any other trees near it. Garbelotto noted: "Gardeners tend to pick the easiest plant to grow. Monterey cypress became very popular in Europe because they grow faster and they grow really well along the shore, while the Italian cypress is better suited for inland regions. The popularity of the Monterey cypress may have inadvertently led to the devastating spread of a deadly fungus throughout the world." Garbelotto explained: "When Monterey cypress trees are planted in Monterey or along the coast, they are resistant to the disease," warning that "the pathogen emerges when we place the tree in a foreign environment." The full study was published this week in the journal Phytopathology.